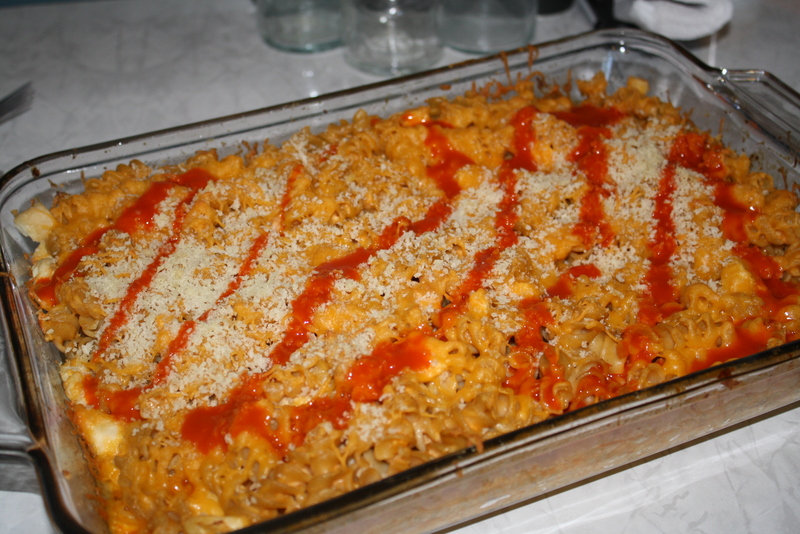 This dish combined so many of mine and Zack’s favorite things: cheese, pasta, and buffalo sauce. Okay, Zack isn’t so big into pasta, but he loves the other two. I made this Saturday night when Dad came over for dinner. He’s also a big buffalo fan, so it was perfect. 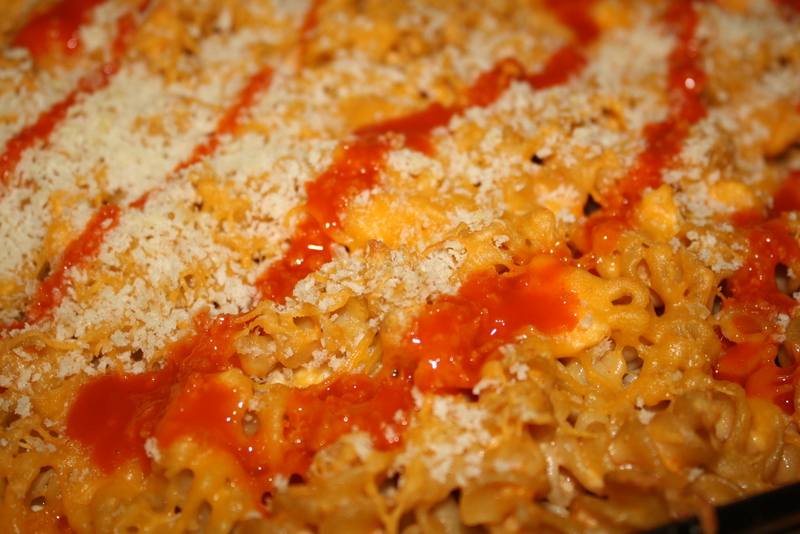 This is basically like macaroni and cheese with buffalo flavor included. YUM. Buffalo sauce is mixed in with the cheese sauce, so I only drizzled some on top. Up close detail of the deliciousness. The white is Panko bread crumbs. While pasta is cooking, heat a medium saucepan over medium heat. Add the butter, and once it’s melted and bubbly, add in the flour. Whisk together and cook 1-2 minutes until mixture gets a bit golden in color. Add milk, stir and turn heat lower. Continue stirring until milk thickens. Add in grated cheeses and continue to stir until mixture is smooth. Stir in buffalo wing sauce. Taste and season with salt and pepper if needed. Spray a 9×13 baking dish with nonstick spray. 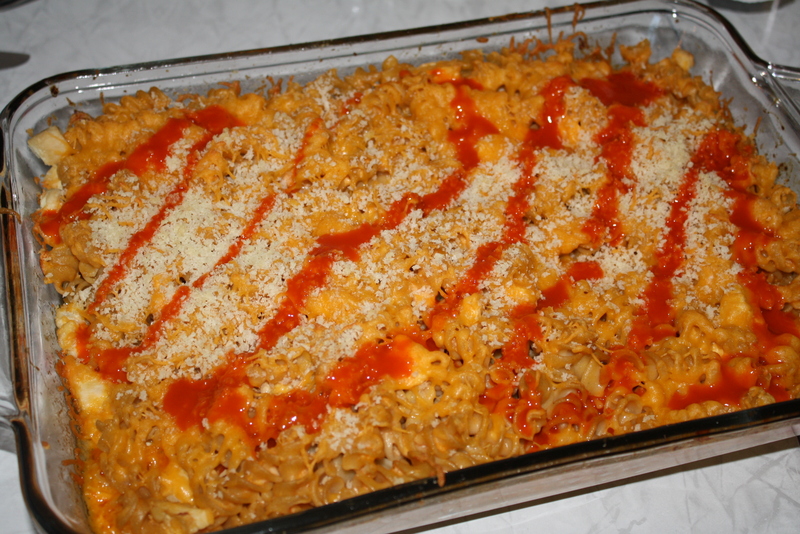 Add pasta and chicken, then pour cheese sauce over and mix thoroughly until everything is coated. Sprinkle with additional grated cheese and bread crumbs. Bake for 25 minutes or until cheese is golden brown. Remove from oven and immediately top with extra cheese and other toppings if you wish. Drizzle with buffalo sauce. This pasta sounds pretty yummy! My husband loves buffalo anything so I might try to make this next! It’s definitely worth trying! Very yummy! Wing sauce with pasta-you outdid yourself for Dad here. I love all things buffalo and this is a unique and tasty one dish meal. Well done-yum! This sounds wonderful! I’m always looking for new ways to use buffalo sauce! We are all big fans in this house. I’m going to have to give it a try! Thanks!! Spicy comfort food! You can’t go wrong in my book. Looks great!